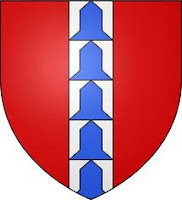 Eldest certain ancestor Audoin de Pérusse, seigneur des Cars, died before 1357. His descendant general Jean-François de Pérusse (1747-1822) was created Comte des Cars on 9-3-1816 and Duc des Cars on 9-3-1816. He died childless and his nephew Amédée de Pérusse (1790-1868) received the title Duc des Cars on 30-5-1825. 82. Paolo (Pablo) De Ferrari Bobbio * Genua … + Valparaiso 22-9-1894; Zn van Giovanni Battista De F. Sforza, emigrated from Genua to Valparaiso, en Margherita B. 87. Luisa Isabel Bello Dunn * … + …; Dr van Andrés B. López en Isabel D.
Hello, Claudia Labarca wass born at Santiago on September 8th 1969. Her daughter was born at Santiago on Ocotber 6th 2009.